At Flava Dance Studios we encourage YOU to listen to the music, grow as a dancer and let the music define YOU. Throughout all levels you will be taught Old, Middle and New school foundations (combined with choreography) so that you understand the fundamentals of Hip Hop Dance. Terms 1 & 3 are Technique/Foundation terms: Specific movements are taught and practiced many times to improve muscle memory. Choreography is also combined within these terms. A great time to start! 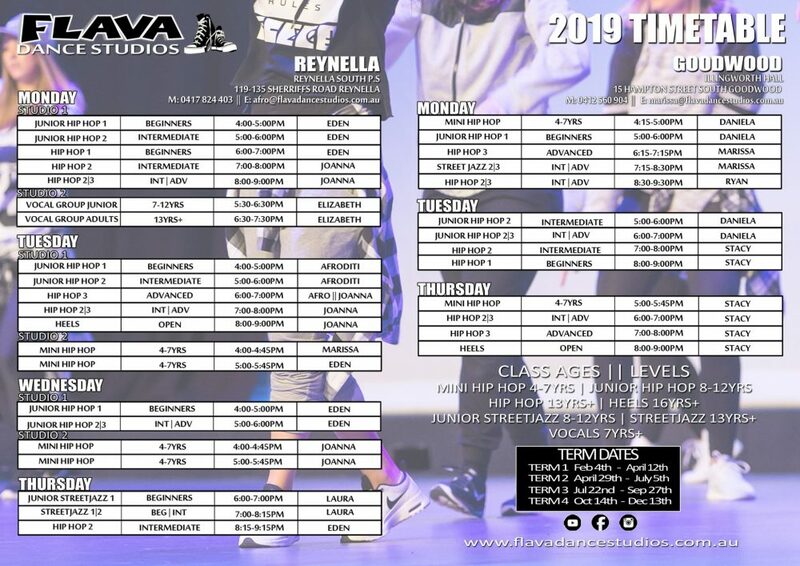 Terms 2 & 4 Students are taught a choreographed routine and are given the opportunity to perform twice a year in Flava’s Mid-year and End of year Concerts in July and December. Click on the class image to see timetable and fees. A great place to start if you have never taken a Hip Hop class before; even if you are a dancer. You will learn the basic technique/foundations of Hip Hop that will get you ready for the next level including isolations, Old-school, Middle school and New school Hip Hop moves. A minimum year’s training is recommended. Relax and have fun! This class is for dancers who have had at least 1-2 years training in Hip Hop technique/foundations. Combinations and choreography are taught at a harder and faster pace. Styles such as basic Waacking combos, Dance & Lyrical are introduced, as well as freestyle exercises, which helps broaden the Hip Hop style. Dancers are expected to have at least 2-3 years of experience in dance, as well as the ability to dance Flavas Hip Hop Levels 1 & 2. Emphasis is on choreography, performance, freestyle and technique drills to enhance the Hip Hop style. Dancers must have more than 4 years of experience in Hip Hop and are expected to know all technique/foundations from Flavas Hip Hop Levels 1, 2 & 2/3. Choreography is taught weekly with emphasis on performance, style and freestyle. Students learn rhythm, co-ordination and basic Hip Hop techniques whilst having fun through games which involve movement. Flava’s Street Jazz classes are a combination of Jazz and Funk often used in musical theatre and film clips. Stretching, Jazz techniques and choreography are taught: turns, kicks, jumps and leaps. Junior Beginners Technique – No experience required. Strength & flexibility are taught through foundation exercises. Street Jazz Int|Adv 2-3yrs+ of previous jazz training is required. Improve confidence and build strength while keeping fit and having fun in a cheeky, sassy way. Everyone is welcome, Ladies and Gents. A group vocal class that will teach songs as choir arrangements, spanning all genres of music, singing in harmony and performing as a group as well as learning basic movement, vocal strengthening (breathing) exercises, scales, vocal technique and basic music theory. AUDITIONS are held yearly for the very best Hip Hop dancers of all ages to represent FLAVA. These teams compete in National and International competitions throughout the year. Term payments must be made by week 3 of each term to receive the discount. Any payments made after this will be charged as a weekly casual fee. There are no refunds or credit on term discount payments for missed classes. 20% discount off 3rd and subsequent classes.